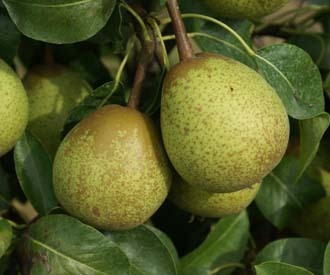 An old Northern English pear suitable for cooler regions. First recorded in 1827. But believed to be much older originating from Hessle near Hull, East Yorkshire, UK. Widely grown in the North of England and Scotland in the past. Small, round conical fruit. Fairly smooth, greenish yellow skin with variable amounts of russetting. White, juicy flesh. Not very sweet and lacking in flavour. A moderate dessert variety but also useful for cooking. Very hardy, disease resistant, vigorous tree. Good cropping. The main advantage of this variety is that it will do well in cooler regions where other pear varieties can not be grown successfully.